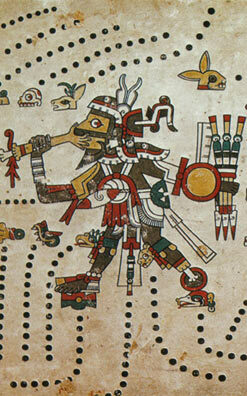 "Codex Fejérváry-Mayer is one of the best preserved of all the Mexican codices. The drawing of the figures and symbols in this manuscript is of the highest quality, lines are of even width and precise direction. Colours are used exactly to fill the spaces alotted for them. Among the experts this codex is justly well known, because of the beauty of its execution, and for the importance of several religious statements painted on its pages." Graz 1971. Vol. 26 of the series CODICES SELECTI. True-color facsimile edition of the hand painted manuscript in possession of the Museum of the City of Liverpool. 46 folded pages. Format: 175 x 175 mm, total length: 3,74 m, folded continuously in PreColumbian screenfold format. English commentary by C. A. Burland, 48 pages, 1 text illustration.